Knight Capital, once one of the fiercest critics of Nasdaq's Facebook compensation plan, has done a 180-degree turn. "We support Nasdaq's efforts to reimburse its member firms for losses caused by Nasdaq's actions and decisions during the first day of trading in FB," Leonard Amoruso, Knight's general counsel, wrote in a letter to the SEC late Wednesday. No one expected Facebook (FB) to debut at the opening bell on May 18, but no one could have anticipated a two-hour delay followed by another 30 minutes of who knows how many botched buy and sell orders that left brokers and investors reeling. Nasdaq (NDAQ) initially said it would offer $40 million to compensate brokers who were affected by the trading glitches. But it upped that figure to $62 million in mid-July. While it would have preferred to see all losses covered, Knight (KCG) said it supported Nasdaq's plan, including the part where Nasdaq agrees to pay for the losses in cash instead of credits against future transaction fees. Last month, Knight said it lost $35.4 million on Facebook's opening day. 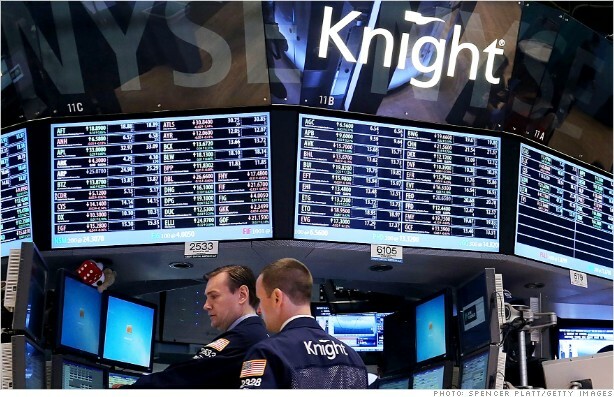 And recently, Knight suffered from its own trading glitch, which nearly bankrupt the firm. The one aspect that Knight did call for regulators to reject was that of a release from claims of civil liability, saying "it would set a harmful precedent." Just last week, Citigroup (C) and UBS (UBS) slammed Nasdaq's compensation plan. Citi said it would cover only "a very small fraction of its losses." But Citadel, which also faced big losses, said Nasdaq's plan was fair. Nasdaq declined to comment. On a conference call in July, Nasdaq CEO Robert Greifeld said the payout would be distributed in the fourth quarter, pending SEC approval. The comment period officially ended Aug. 22, putting the final decision in the SEC's hands. Regulators have three options: approve, disapprove or hold hearings to decide whether to disapprove the proposal. The SEC has until Sept. 14 to decide but it can extend that deadline for another 45 days.